Nobody likes sitting in traffic jams, particularly because it’s kind of hard to do anything else while you’re waiting for the car in front of you to just move it already, grandpa, there’s like an entire car’s length of empty space ahead of you. 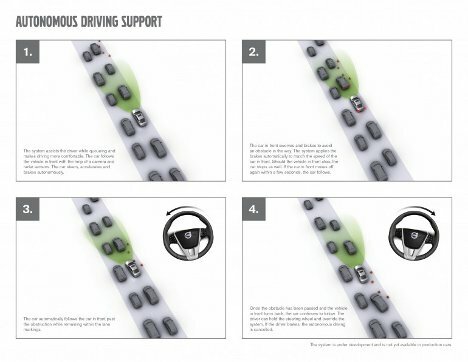 But Volvo has developed a system called Autonomous Driving Support that could keep us all a little calmer behind the wheel – or stress us out more, depending on how scared you are of technology that drives your car for you. The system activates at the push of a button and keeps your car moving at slow speeds (below 50 km/h or 31 mph). It uses radar sensors and a camera to keep the car in the right lane and to maintain a consistent distance behind the car directly ahead. The system can even steer around obstacles in the road as long as your car stays in its lane. The driver can take back control anytime, so if you suddenly decide that the other lane is moving faster you can whip over there without worrying that the auto-pilot system will rebel and keep you in place. See more in Cars & Trucks or under Transportation. October, 2012.